History and background of the Royal Pioneer Corps 3. The true glory of the war against Fascism belonged to the ordinary soldier; to the Infantryman, the mechanised Trooper, the Sapper, the Driver, the Pioneer. This article is a brief review of the great part played by the Pioneer in the campaign in North-West Europe. It would be impossible, in an article of this size and scope, to allocate the credit fairly; many important events will be omitted or glossed over. It is hoped that these shortcomings will be excused. From the early hours of the Normandy Beaches, through all the main engagements in France, the Lowlands and Germany, up to the final assault over the Elbe, the Pioneer was there. He was ready and eager to tackle any job. The range of his activities was wider than the majority of other soldiers. He was airborne to Arnhem, he was an important element in the chemical warfare force whose task it was to obscure our tactics from the enemy with smoke screens; with the Engineers he built bridges, repaired railways, maintained roads; with the Service Corps he brought up vital supplies and stores; with the Ordnance Corps he helped to keep up the flow of guns and ammunition; he could be found working in hospitals or acting as stretcher bearer with front-line troops. On D-day of the invasion of the Continent, 6 June 1944, 13 Pioneer companies landed with the first tide and a further ten companies with the second tide, making a total of about 6,700 men ashore by the end of the day. By the end of D + 2, three Pioneer Group HQ and 42 companies were ashore (about 12,000 men) and by D + 5, when Second Army took over command from the Corps, the totals had increased to 10 Pioneer Groups and 63 companies, representing approximately 19,000 men. “170 Company. June 6, 0825 hours. First serials landed on Nan sector, White and Red Beaches. Landing craft struck a mine on landing. Some opposition, particularly heavy sniping on Red. Some isolated pill boxes still holding out. These were eventually silenced by guns of landing craft. “13.30 hours. Remainder of company, including OC, land on White Beach. Tasks: clearing Red, White and Green Beaches, laying lateral track and constructing wheeled and track exits. “129 Company. June 6, 0800 hours. Disembarked on Red Beach under mortar fire. Water at commencement of day was only ankle deep but rose to 3ft 6ins. Moved to prearranged rendezvous. While going through a partially cleared minefield, two of our stretcher bearers brought in three wounded – commandos who had been lying in the open for four hours. Several enemy pockets were encountered and broken up by concentrated mortar fire. Working on beach and road clearance"
“293 Company. June 6, 0800 hours. Lay off beaches and at 12.30 landed and immediately commenced collecting casualties. Worked all night. Intermittent bombing but no casualties"
“June 7. Continued collecting casualties from beaches and inland, transporting them from BDS to FDS, and then loading them for evacuation. Loaded two landing ships with wounded. Bombed again during the night but no casulaties"
“June 8 and 9. Collecting casualties and evacuating them by sea, collected dead"
“June 10. HQ staff also evacuating casualties. Two killed and one wounded by enemy action"
“June 11. Evacuated 500 casualties. Quiet night, no bombing"
“Evacuation was one mad rush against the tides, but it was seldom that Father Neptune won the race, even during the spell of bad weather shortly after D-Day. On one occasion, a chain was formed to load the last 50 wounded by passing the stretchers from hand to hand overhead. The last man was put aboard as the water lapped the chins of those in the chain"
“73 Company. June 7. Landed wetshod at 1600 hours. “June 9. Clearing Bernieres-sur-Mer of snipers and spies"
“June 10. Clearing Courcelles-sur-Mer of snipers and spies"
The build-up of the force was rapid and by D + 25, all the Pioneer units allotted to Second Army, amounting to 14 Pioneer Group HQs and 115 Companies (33,500 men) were in Normandy. By D + 79, the complete Pioneer Order of Battle consisting of over 68,000 officers and men, had been brought to France. A force which was built up to 34 Group Headquarters, 231 Companies and 23 Pioneer Civil Labour Units (PCLUs). As far is known, the first Pioneer party landed 20 minutes after Operation Overlord had started, their task being to assist in mine clearance and to dig a Command Post in preparation for the arrival of the Beach Group Commander. Other parties soon followed them and set to work establishing beach exists, laying Sommerfield track and repairing the roads from the shore ready for the tanks and Armoured Fighting Vehicles to advance. Bridging equipment was unloaded and assembled, road blocks demolished, beach store depots built up. The Pioneers who arrived with the assault troops landed 'wetshod', which often meant a long wade ashore in full equipment. Some had to swim ashore from grounded craft. Pioneers working in the water laying flexible causeway off the ramps of the landing craft, were engaged on particularly hazardous work in rough seas. Many of the men came under heavy artillery and small-arms fire in the early stages, but casualties were surprisingly light. Parties took part in fighting operations to clear strong points. The two most notable of many incidents were the capture of 86 German Marines by a fighting patrol of 120 Pioneer Company, and of one officer and 26 men by another patrol of 225 Pioneer Company. Pioneers performed many difficult and dangerous tasks during the early days of the assault, for which their varied training and wide experience proved invaluable. A party of 53 Pioneer Company, for instance, formed a chain and localised what might have been a serious conflagration, when an aircraft crashed on a petrol dump and started a fire which spread to an ammunition depot. Two of the party were decorated with the George Medal for their part in this task (you can read all about this event in the honours and awards section). After the initial assault on the beaches, the highest priority was given to the task of establishing airstrips for which 11 Pioneer Companies, forming part of the five Airfield Construction Groups, were landed on D + 1 and D + 3. Most of the men were employed in laying track on the runways and on operating technical equipment. Pioneers were clearing the main line of communication through Caen as soon as the town had been captured. All Pioneers landed during the build-up were earmarked for special kinds of work. Those that could not be linked up immediately with their employing services were quickly absorbed on other tasks, mainly on road construction, which represented a very real problem, or in ammunition and petrol dumps. At one time, there were about 20 companies working in roads, and a small amount of civil labour, which was enlisted, paid and controlled by Pioneer units specially created for this task. The existing roads were completely inadequate and too narrow to cope with the traffic of a modern army; new roads and by-passes had to be constructed. The thick, blinding dust and positive danger from constant streams of passing traffic made this work very unpleasant and difficult. When the weather deteriorated, causing a considerable reduction in the quantity of stores that could be landed over the beaches, all the available Pioneers were turned on to handling ammunition and during the peak period, some 12 companies were employed on this work. No 36 Pioneer Company, previously trained for the job, was allocated for work at Port-en-Bessin on the laying of pipelines to Caen and Lisieux - pipelines which were to feed the armies with petrol and which subsequently were to continue right through Belgium, Holland and across the Rhine. Three other Pioneer Companies were also employed on similar work. In the crossing of the River Orne, Pioneers working with 8 Corps bridged the river and canal and had the difficult task of helping to rebuild the road through Colombelles after it had been pulverised by the Royal Air Force. During the break out, they were called upon to provide burial parties, for which they were given special clothing, equipment and transport. Owing to the extensive minefields, conditions were dangerous but the work was well done. Casualties were suffered. 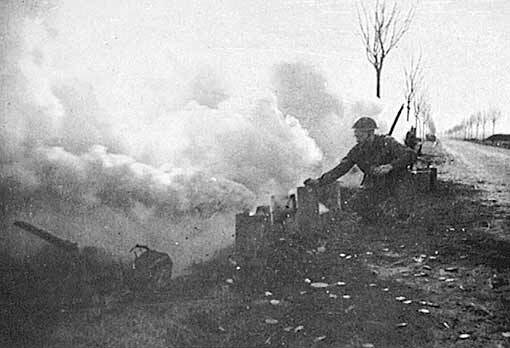 A Pioneer Company, working with 59 Division, was entrusted with the task of laying a smoke screen across the River Orne, during which they lost their Company Commander and three men killed. At he same time, a Pioneer Group and four companies were regularly employed on unloading ships from Mulberry - the prefabricated port - and three Companies were operating Dukws. Other Companies were erecting tentage for Casualty Clearing Stations and General Hospitals or setting up Bailey bridging; some were used in REME workshops repairing landing craft and tanks, and on the responsible task of signposting and traffic control. The men bivouaced in fields, in unusually bad weather, working extremely long hours with little rest. As the operation developed, the Pioneers were called upon to undertake more and more varied jobs. 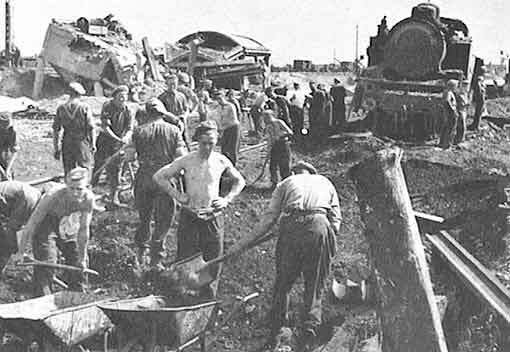 The arrival of administrative units was slowed down owing to a lag in the shipping programme caused by the bad weather, but in spite of this ten Pioneer Companies were called forward urgently in mid-July to replace Infantry Battalions in Beach Groups and more and more units continued to pour into the Maintenance Area. The Corps at its peak in May 1945 was probably the largest Corps in the Army. It included 12,000 Officers, 166,000 British Personnel and 400,000 Commonwealth Personnel. As well as being responsible for a civilian labour force of 1,074,000 and a Prisoner of war force of 173,000. Over 2,000 British personnel, serving with the Corps, and nearly 6,000 other nationalities lost their lives during the war. Many decorations for gallantry were gained by Officers and men of the Corps. A list of these decorations follow. The highest award received by a member of the Corps was the George Cross, awarded to Cpl JP Scully on 8 July 1941. A copy of the citation also follows in the honours and awards section. The Corps gained many awards for gallantry and in addition received American, French, Dutch, Greek, Belgian and Italian awards. Some 2,800 men of the Corps laid down their lives oversees. On 26th November 1946, his majesty George VI decreed that in recognition of its services the Corps should have the distinction "Royal" added to the title. In February 1950 the Royal Pioneer Corps became part of the Regular Army. Since the end of World War 2, Royal Pioneer Corps officers and soldiers have played their part in all operations overseas. In the long and glorious history of the British Army no other Corps or Regiment has earned this single honour in so short a time.